Coming up the ranks quietly behind the Tesla Model S and the Nissan Leaf is an EV that is starting to win all of the comparison tests it enters. Would you have guessed it is the Chevy Spark EV? Barra and VoltThe final tallies for 2013 sales are in for the Chevy Volt and its little sister, the Chevy Spark EV. The results are ugly. ‘It’s a rocket,” said Dave Barthmuss, GM’s Western Region PR Manager, when I took delivery of the new 2014 Chevy Spark EV for a four-day test drive in Southern California. It’s a frequently asked question: Will the 2014 Chevrolet Spark EV be sold where I live? General Motors had earlier announced that sales of the Spark EV would expand to Europe, and also to Canada. I am sometimes a neighborhood recluse, seldom moving beyond the boundaries of my Arlington, Va., community on days when writing duties tie me to my home office. I take meal breaks and “soul breaks” — and time for short errands, usually traveling to local restaurants, shops and churches. Why Chevrolet Needs To Sell the Spark EV Across the U.S.
Chevrolet’s Spark EV is sold only in California and Oregon. General Motors confirmed last week that it has no plans to sell its all-electric Spark EV beyond select places in California and Oregon, reinforcing the widely held belief that the 2014 Spark EV is a compliance car that GM really didn’t want to make. The Chevrolet Spark is an international car, designed by General Motors in Korea, and the company intends to sell the plug-in electric version of it there, as well as in Europe. 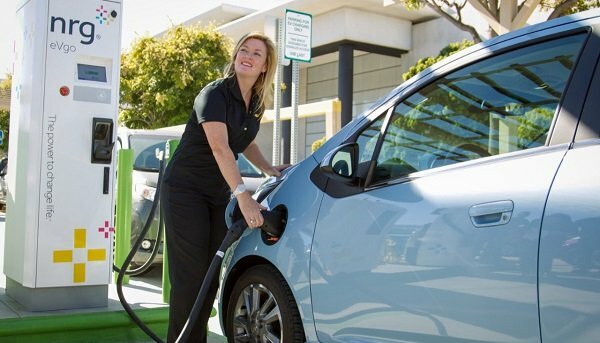 Can the 2014 Chevy Spark EV Electrify GM’s Drive to Go Green? General Motors is often blamed for killing the electric car in the early 1990s. However, it could now be said that GM is about to supercharge the electric-vehicle revolution, with the launch of its 2014 Chevy Spark EV. In fact, the company appears to have built an “electric” car in more ways than one. General Motors has been building modern electric cars longer than anyone. It started developing EVs in earnest with the purpose-built, low-volume EV1 in the 1990s. Now its latest electric car is based on the tiny Chevrolet Spark. Can Chevrolet Beat Nissan’s Leaf On the Pricing Field? For those eagerly awaiting an electric car that won’t break the bank, Chevrolet (NYSE:GM) has answer: the electrified version of its Spark compact car, after the deduction of the $7,500 federal tax credit, will come in below $20,000. With a retail price of $27,495 without the tax credits or other perks, the Spark is among the cheapest EVs hitting the market. General Motors said Wednesday that the battery-powered version of its Chevrolet Spark mini-car can travel up to 82 miles on a single charge, putting it among the leaders in mass-market electric vehicles sold in the U.S.
Eighteen months ago, GM announced that it would build the electric motor for its upcoming Chevrolet Spark EV electric car in the U.S.
Now, that motor is officially in production at the company’s Baltimore Operations plant in White Marsh, Maryland–along with the associated final-drive unit–fulfilling a promise originally made in January 2010. As the New York Auto Show takes place here, automakers are also putting in time at the Seoul Motor Show. Hyundai, Toyota, GM, BMW, Volkswagen, and Ford are all showing off cars, trying to strike the balance between the functionality of the SUV and the necessity of eco-friendly electric cars in congested Asian cities. The 2012 Los Angeles Auto Show was filled with innovations in safety, infotainment, and battery-powered electric vehicles. With plenty of tech to pick from, we decided to dive a bit deeper on two of our favorites from the show: the Chevy Spark EV and BMW i3 Coupe.